Up front advertising can make a huge difference. Ideally you want to use social media, Facebook and Twitter in particular, the former to get friends there, the latter to get anyone else who might be interested. The bookstore can advertise it on their website, and we (my sister and I) made up posters and flyers and put these up about two weeks before the date; too early and people forget, too late and they have something else to do that day. Two weeks worked for us. Newspaper articles and radio interviews in the same week are excellent ways to advertise an event, unfortunately we didn't get any takers. We did it on a Saturday, between 10:30am and 4pm, the day after World Book Day. Saturday is good for business, and also there is more chance for support (see later). 'Traffic' dropped off around 1:30 so I grabbed a quick lunch then, and by 4pm it was starting to tail off. 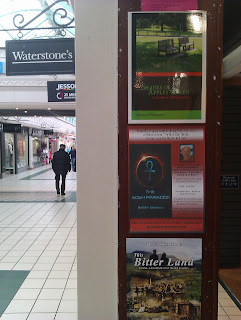 Location was Waterstones in a shopping centre in Camberley, a provincial town 30 miles from London. I did it there because my family is in the area. I did another one in London, and sold twice as many books. But I have to say I enjoyed the Camberley one more, after all, it was where I grew up (I now live just outside of Paris). It also helps to have an eye-catching front cover! Support was mainly my family, particularly my sister, who stood outside the shop with flyers, trying to get people to come inside and take a look. This accounted for about half the sales - the rest were people in the shop who took an interest. 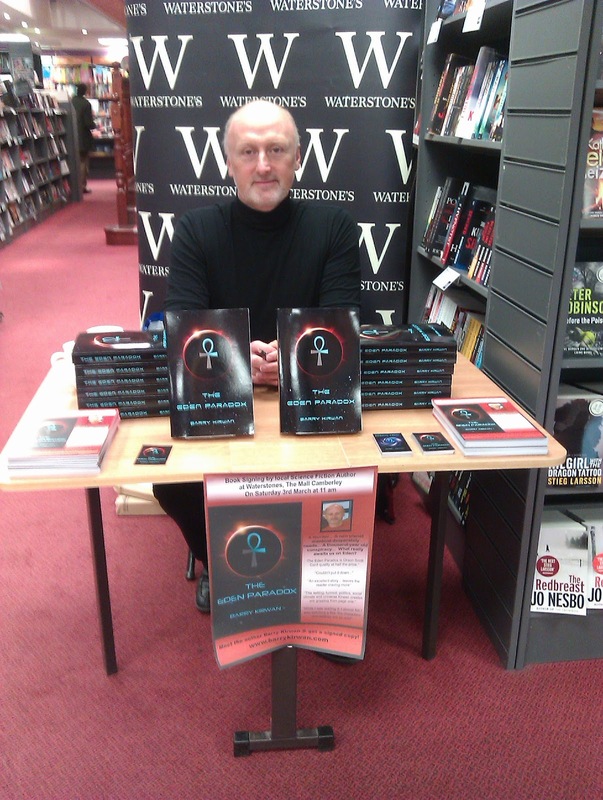 The bookstore staff were great, but it was a busy Saturday (nice to see as an author). My genre is science fiction rather than mainstream. One slight inconsistency was that the science fiction and fantasy section in the bookstore was at the back, and I was at the front, but I don't think that mattered too much in this case. However, it is not the easiest genre to sell, since not everyone likes SF. 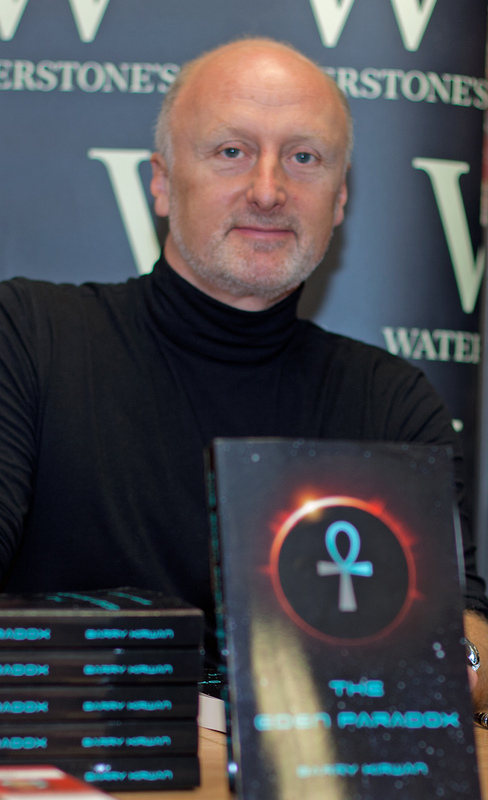 A couple of people did talk to me about the book, and stated they preferred fantasy. I wasn't going to mislead them, and made it clear that it was SF. Others however, said they liked thrillers, and my book certainly falls into that category, albeit it is a thriller set in 2065, and has SF feel. Genre is something you have to be clear about in your own mind. Someone asked me if it was Steampunk, and I said no, but that if anything, it had cyberpunk elements (it does, influenced as I was by William Gibson's Neuromancer). It also helps to say which authors it resembles and who my favourite authors are (these are not necessarily the same). But in short, you need to know your own genre and sub-genres, adjacent genres, and other genres. It helps if you are well-read. Customer behaviour is intersting (well, I'm a psychologist, so what else am I going to say!). Many people would enter the shop and see me sitting there, and then avoid all eye contact. To make it easier on them (and me) I picked up a book by Mike Reynolds (a bit like Lee Child - I was sitting in the 'Crime' section), read a chapter, and then picked up a Philip Kerr novel (better writing, I'd have to say). I'd glance up occassionally, maybe catch someone's eye, smile as if to say 'I don't bite', then carry on reading. Most smiled back. "It's set fifty years in the future, Earth is pretty much an environmental mess, and a new planet is discovered which appears to be perfect. However, the first two missions there fail to return. This book is about the third mission." I don't think of this pitch as a hook, by the way - it is more the bait on the hook. I'd wait to see what they said, maybe adding 'It's basically a thriller set in the future." Since SF people like trilogies, and most readers want to know if you're a 'one-book wonder' or a serious professional writer (someone worth investing time and money in), they'd often ask if there was another book in the making. I could then show them the card for book 2 (only on ebook at the moment), but could say it was coming out in paperback in September, and that I was currently writing book 3. People would then look at the back of the book, maybe open and read something inside (mostly not). Then, they'd say something like 'Well, why not," and buy the book, and I'd ask who to dedicate it to, and check how they spelled their name. And I'd genuinely smile, and shake their hand, because as an author these little three minute transactions are important. About a third who bought it weren't normal SF readers, but liked the look of the book, the fact that it was a thriller, and probably it was also simply the chance to get a signed copy of a book. Some people politely declined, or said it wasn't their thing. I'd smile and say that's okay (because it is). One guy overheard my pitch to someone else (who declined), and then said "I've never heard of you, but I liked what you just said, so I'm going to buy it for my sister who likes this sort of stuff." Great. So, my attitude was that I was happy to be there, because I was: it took me years to get published, and my family and friends came to see and support me, and it was a real pleasure to see so many people buying books, and to meet people and make the occasional sale. In the end we sold fifteen books; not that many, but apparently about average, and not bad for a genre like SF. The bookstore's record was 95. In the London one I sold 30 and would have sold more if I hadn't have run out of stock. Is it worth it? Financially, no. Posters and flyers cost money, and the profit for say 30 books probably won't cover it, although in the few days following there was a spike in sales via Amazon both for hard copy and ebook, a delayed effect probably due to the flyers distributed. But it can be good for 'word of mouth' after-selling, especially as some people who bought it probably never would have otherwise. Personally, it was definitely worth it, especially as it was my old home territory. I've always loved books and reading, and bookstores, particularly Waterstones, and it was just nice and down-to-Earth to meet complete strangers and see them get interested in my book, something I miss with Amazon, for example. For me, it has been a final 'right of passage' as a beginning writer. So, it is often said that writing is ten percent inspiration and ninety per cent perspiration. But the inspiration part is important and necessary. 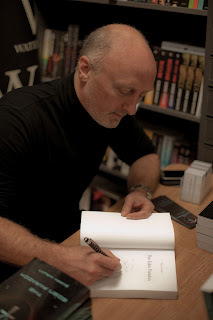 Book signings can be inspirational to an author, not in the sense of generating ideas, but in the sense of being motivational, that what you are doing is real and worth the effort. 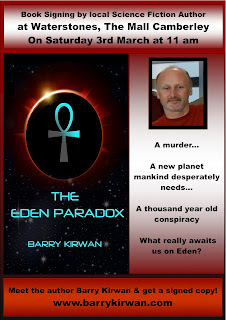 The Eden Paradox is available in paperback and ebook on Amazon, Barnes & Noble, Waterstones, OmniLit and Ampichellis. 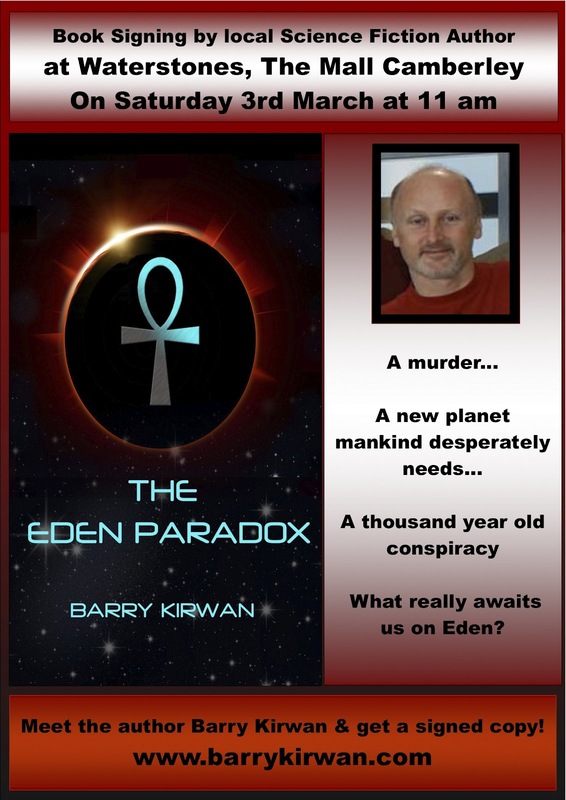 Eden's Trial, the sequel, is available in ebook on Amazon, paperback due out Autumn 2012. The finale, Eden's Revenge, is due out in ebook Xmas 2012, paperback Spring 2013.